The aroma of garlic added to tender mushrooms and lashings of butter make the recipe for garlic mushrooms very appealing. This recipe is easy to make and can be varied according to the size of the mushrooms. 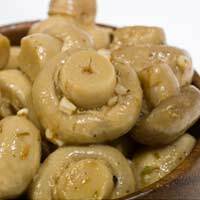 Add additional items to the recipes to make variations on the original garlic mushroom meal. Never wash mushrooms as they will absorb the water and go very soft when cooked. If they are commercially bought, give them a quick rinse to remove any chemical compost used. They have skins resistant enough to water to be rinsed under running water, but don't steep them. By putting mushrooms into a flavoured sauce or gravy they will quickly soak up the flavour of the dish, hence garlic mushrooms are delightfully buttery although not good for the waistline! This recipe is an accompaniment to a meal and can make a rather bland steak or chop taste extra delicious. If you decide to follow one of the alternative recipes double the ingredients and enjoy them for lunch or supper. To prepareBrush the mushrooms to clean away any debris and peel a slice from the bottom of the stalk. Place a small piece of the butter into a saucepan and heat. Add the finely chopped garlic and cook gently until soft. Add the rest of the butter, the parsley, and the mushrooms. Continue to cook gently until the mushrooms are tender and have soaked up some of the butter. Preheat oven to 200 degrees C gas mark 6.Grease a casserole dish that will take the mushrooms without overlapping them. Brush the mushrooms to clear them of debris. Remove the stalks, trim away the dried end part and chop the remaining stalk. Add a small piece of butter into a small pan to melt. Add the garlic and cook until soft. Add the chopped mushroom stalks, parsley and remaining butter and cook gently until ingredients have melted. Divide the breadcrumbs between the open mushrooms then pour over the garlic butter mixture. Season with salt and pepper to taste. Place in the top of the oven for fifteen minutes or until the mushrooms have become tender and succulent. Change the butter for a low calorie spread. It will not be quite as tasty but you will feel more virtuous whilst eating it! Make the above large mushroom recipe halving the amount of butter. Add a little chopped cooked bacon or ham and a slice of cheese before adding the breadcrumbs and garlic butter mix. Place under the grill until cooked. Alternatively, omit all the butter apart from a small piece to cook the garlic and instead mix parmesan cheese with the breadcrumbs before putting the garlic and parsley on top of the mushrooms. Place under the grill until cooked. If you are able to use fresh parsley you will have a greener brighter looking recipe but if this is being cooked from store cupboard ingredients then dried parsley is just as good to use. Why not cook a delicious Mixed Grill to have with your gorgeous garlic mushrooms and what about some Easy Fat Free Chips?